This website is designed to serve as a resource to our growing and diverse Provider Community. It is one of the many ways in which Alameda County Behavioral Health Care Services strives to support the community’s informed access to care. We hope you find this information helpful as you participate in serving our community. Description: During this session, the participants will be engaged in lecture as well as case based interactive discussions. The goal is to give non-prescriber's sufficient knowledge and skills so that can better assist in the diagnostic and treatment process for African American clients. DESCRIPTION: This highly interactive training is designed to address the self-care needs of those working with children, youth, and adults impacted by traumatic life events. The group will look at several tools and techniques to circumvent the most challenging aspects of their compassion fatigue and to be able to regain a state of neuro-physiological (mind-body) regulation, recovery and resilience. This Continuing Medical Education (CME) training will equip participants with the knowledge and resources to respond to an opioid overdose, including the administration of naloxone, and to effectively educate at risk consumers on opioid safety. Naloxone will also be distributed to each participant. Training Available to the first 50 to RSVP! RSVP by 12 pm on 4/19/2019. 10x10 Wellness Campaign's 8th Annual "We Move For Health"
The 10x10 Wellness Campaign's "We Move For Health" is back! Come out for this amazing event! The CYASOC would like to announce the appointment of our new TAY Program Services Coordinator, Shannon Singleton-Banks. We are very excited to have her in this new role in our system. Shannon will be supporting the TAY Division by providing coordination on behalf of the TAY population as they intersect with many systems including Housing Services, Vocational Rehabilitation services, Non-Minor Dependents, and our Criminal Justice Mental Health services. Please join me in congratulating Shannon in her new role as the TAY Program Services Coordinator. 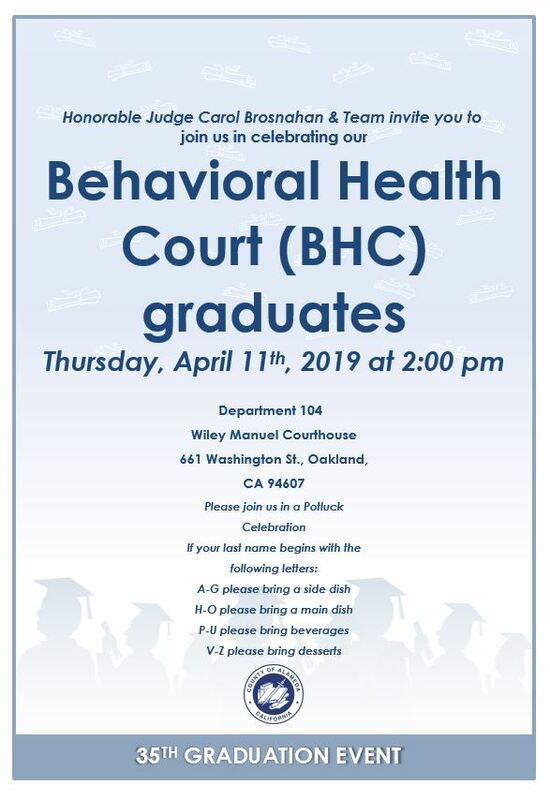 Honorable Judge Carol Brosnahan & Team invite you to join us in celebrating our Behavioral Health Court (BHC) graduates on Thursday, April 11th, 2019 at 2:00pm. Department 104, Wiley Manuel Courthouse, 661 Washington St., Oakland, CA 94607. Please join us in a Potluck Celebration. If your last name begins with the following letters: A-G please bring a side dish, H-O please bring a main dish, P-U please bring beverages, V-Z please bring desserts. I am excited to announce Stephanie Lewis as the new Division Director of Crisis Services. Stephanie has spent the last several years supervising crisis support services, conducting crisis intervention, and planning and implementing the new crisis system of care for ACBH. Please join me in celebrating her much deserved appointment! Description: This Five-Part training series is designed to help clinicians and professionals working with the Afghan immigrant population in Alameda County to understand and better accommodate the various mental health challenges the Afghan refugees are experiencing. *Attending all five parts is encouraged for the most benefit, but not required. Description: This Continuing Medical Education (CME) training will engage participants in a series of activities, and discussions that will increase their awareness and sharpen their skills in working with children with incarcerated parents in a variety of settings. Free CME's/CEU's. Breakfast begins at 8:30, the training starts at 9, lunch at 12p. Training Includes a Panel of impacted Children and Families among other activities. 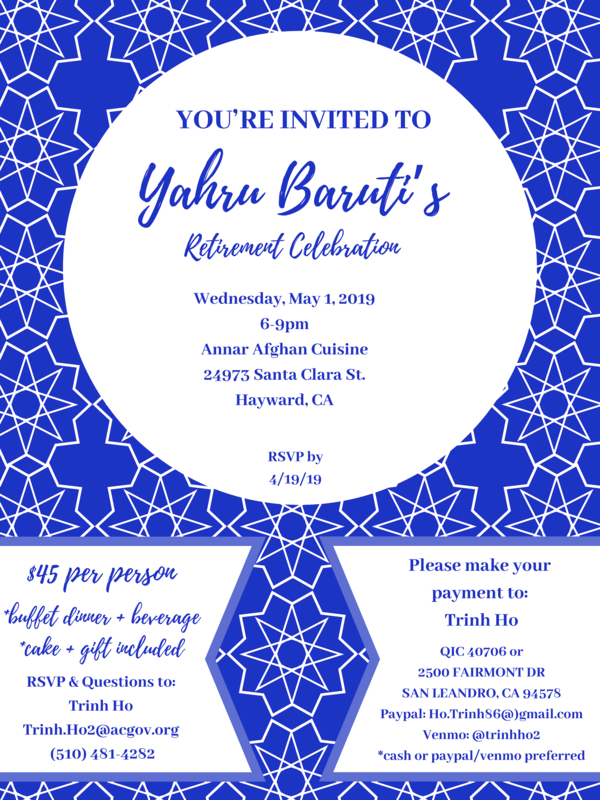 Please join us for a Retirement Celebration honoring Yahru Baruti! As some of you may have heard, we lost a member of our provider community recently. John Knowles, the Director of East Bay Community Recovery Project (EBCRP) has passed away. Lifelong/EBCRP will be hosting a Memorial/Celebration of Life event for John on Wednesday, March 27, 2019 from 2:00pm-4:00pm at First Presbyterian Church of Oakland on 2619 Broadway in Oakland in the Reception Room. This event is for past and present staff, community providers, etc. There is limited parking around the church, so attendees may want to carpool. *There is a separate event for Partners being planned. DESCRIPTION: This two day, in-depth training combines lecture, large and small group discussion, role plays and self-reflection. Dr. Bennett will facilitate the 15 hours during which participants will examine the Board of Behavioral Sciences rules and regulations, evaluate on-line and film examples of therapy and supervision, explore their own experiences and discuss what traits make an exceptional clinical supervisor. The second day will involve lecture, large and small group discussion and self-reflection regarding Secondary Trauma. Students will participate in exercises to determine their own obstacles as well as possible supervisees’ experiences with trauma. Diagnoses will be presented from the Diagnostic and Statistical Manual V. There will be time for case consultation throughout the two days. "What does it mean to be a culturally competent mental healthcare professional?" Despite the development of several models of service delivery to meet the challenges of caring for culturally and ethnically diverse clients, mental healthcare professionals have not come to a consensus on this vexing question. In this workshop, Dr. Campinha-Bacote will address this question by examining one of the 5 components of her practice model of cultural competence, The Process of Cultural Competence in the Delivery of Healthcare Services. Please join ACBH and HHREC to celebrate the kick-off of the 2018-2019 Health through Art Roving Art Campaign. View the new art installation and meet the winning Alameda County artists from the 12th Annual Call for Art. DESCRIPTION: The goal of this presentation is to describe Seeking Safety, an evidence-based model for trauma and/or substance abuse (clients do not have to have both issues). By the end of the training day, participants can implement Seeking Safety in their setting if they choose to. Seeking Safety teaches present-focused coping skills to help clients attain safety in their lives. It is highly flexible and can be conducted in any setting by a wide range of clinicians and also peers. There are 25 treatment topics, each representing a safe coping skill relevant to both trauma and/or substance abuse, such as “Asking for Help”, “Creating Meaning”, “Compassion”, and “Healing from Anger”. AUDIENCE: All classifications of Alameda County Behavioral Health and contracted CBO staff. Description: The purpose of this training is to meet and exceed the requirements of regulatory clinical licensing organizations for mental health professionals in maintaining competence in legal/ethical standards and updates. Participants will receive a review of key ethical and legal concepts, regulatory and other legal changes that affect professional practice. The training will be taught at an intermediate level, and is appropriate for currently licensed professionals, and meets BBS and APA requirements. Trainer: Daniel O. Taube, PhD., J.D. Capacity limited, open until filled. Registration DEADLINE is two (2) days prior to training date. TAY County-Wide Quarterly Provider Meeting Kick-Off!!! Description: Please join the ACBH Child and Young Adult System of Care TAY Division for the re-launch of the TAY County-Wide Provider Meeting. This quarterly gathering shall act as a collaborative movement which provides a platform for TAY providers to: share resources, foster networks & build community, identify key issues affecting TAY who are unserved, underserved and disconnected from resources, and create solutions to expand access to care! QA's Clinical Documentation Training for EHR users is our only Line Staff documentation training. This training addresses mental health assessment, client plan development, and service provision documentation requirements in the Electronic Healthcare Records System: Clinician’s Gateway. There are seats left for next Friday's Training, register here. Please view the memo for a personal thank you from the ACBH Executive Team to the many social workers, clinicians, and other staff members in our department who work tirelessly each day to better the lives of individuals who face mental health challenges. Jeff decided to have a very simple "farewell" party exclusively for ACBH staff. Cake, coffee, tea and spa water will be served. Everyone who wants to will have the opportunity to tell a story, just say something wonderful or give a fond farewell. 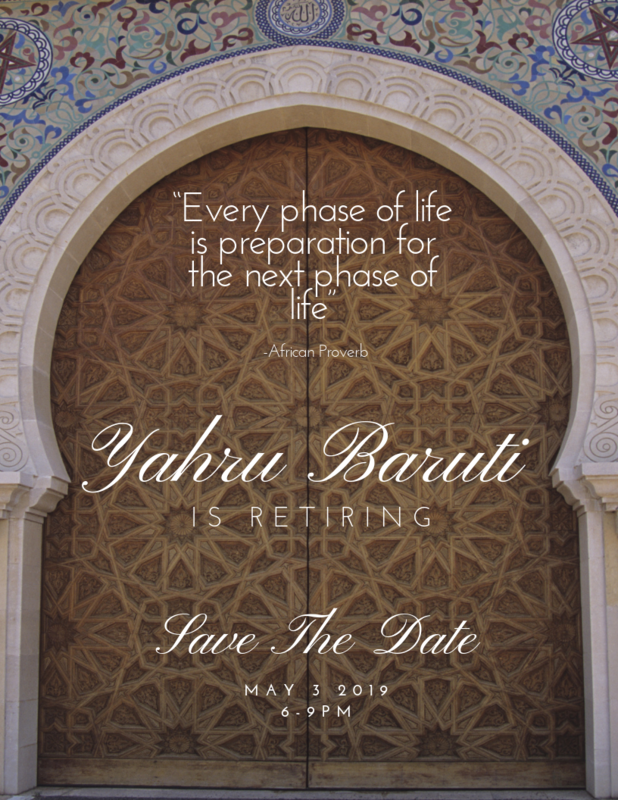 Save the Date - May 3, 2019 - Yahru Baruti's Retirement Celebration! Location: TBA - Details coming soon! This intensive 2-day, 14-hour, workshop is designed to immerse bilingual interpreters in the principles and practices of interpreter communication skills. Participants must be proficiently fluent in at least one language other than English. DESCRIPTION: Youth Mental Health First Aid introduces participants who work with youth to the unique risk factors and warning signs of mental health problems in adolescents, builds understanding of the importance of early intervention, and teaches participants how to help an adolescent in crisis or experiencing a mental health challenge connect with appropriate care. AUDIENCE: All classifications of ACBH and contracted CBO staff are welcome. ** PLEASE NOTE: while we welcome mental health professionals, Mental Health First Aid was designed for the general public to receive basic mental health information to enhance the safety net within our communities. DESCRIPTION: Adult Mental Health First Aid presents an overview of mental health and substance use issues in the U.S. and introduces participants to risk factors and warning signs of mental health and substance use concerns. Participants will be taught a 5-step action plan encompassing the skills, resources, and knowledge to help an individual in both crisis and non-crisis situations connect with appropriate professional, peer, social, and self-help care. AUDIENCE: All classifications of ACBH and contracted CBO staff are welcome. **PLEASE NOTE: while we welcome mental health professionals, Mental Health First Aid was designed for the general public to receive basic mental health information to enhance the safety net within our communities. With a delicious Mediterranean buffet from Bacheesos Restaurant and lots of old and new friends, it promises to be a fantabulous party! DESCRIPTION: This is a skill-building workshop on how to perform one-on-one tobacco cessation interventions. Participants will learn the basics of Tobacco 101 and how to apply counseling techniques to motivate and support tobacco cessation among high-risk populations. AUDIENCE: Clinical Staff of substance abuse, mental health and primary care providers, Health Educators, Community Cessation Facilitators, Case Managers, Home Health Care Workers, Nurses and other healthcare providers. The attached flyer provides information on several town hall meetings that will reveal information about ACGOV Vision 2026 and how your work is critical to its success. We will be hosting a live stream watch party on Tuesday, February 26, 2019 beginning at 3:00 p.m. The watch party will take place at 2000 Embarcadero Cove in the Joaquin Miller Room. Everyone is invited to attend. Also, please note the other locations listed on the flyer as well. For more information on Vision 2026, please visit https://vision2026.acgov.org/index.page. View Flyer for more details! OOD'S Climate Change Initiative: StrengthsFinder Session Open! I’m very pleased to announce the appointment of Dr. Melissa Vallas to Deputy Medical Director of Alameda County Behavioral Health (ACBH). Dr. Vallas’ background experience adds valued depth to the Child and Young Adult Executive Leadership team, supporting our efforts to improve access to services and quality of care for the children and young adults across Alameda County. Please join me in congratulating Dr. Vallas and offering her best wishes in her new leadership role. View attachment for more details! Location: 2000 Embarcadero, Suite 400, Gail Steele Conference Rm. ACBH & The Pacific Center offer this training to address MH Services for LGBTQI2-S populations. This first training in the series will address the experiences of Transgender and Non-Binary Populations. Staff from ACBH and Contracted Providers are welcome. I am very pleased to announce that Lisa Carlisle has been selected to become our Children and Young Adult System of Care (CYASOC) Director. Please view attached announcement for more details. I am very pleased to announce the promotion of Cecilia Serrano to Finance Director position starting February 24, 2019. The Office of Ethnic Services would like to share the African American Mental Health Training and Technical Assistance Program (AATA). 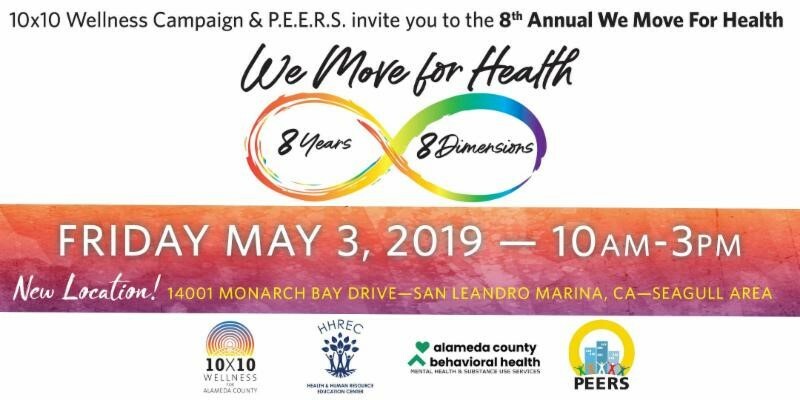 The first half-day session will describe the African-American population in Alameda County and our current behavioral health provider network. This workshop will cover issues related to cultural competency and health equity for African-American behavioral health clients. Join us in wishing Jeff well as he sets out on this new adventure! Focus Group on Behavioral Health Services for African American Clients. View flyer for more information and locations. Please join us for a Retirement Farewell Party honoring Jackie Mortensen! Juliene has 19 years of experience providing services to consumers, supervising staff, and managing programs serving adults with serious mental illnesses and co-occurring disorders. She has worked in inpatient, forensic, outpatient, and residential settings in Santa Cruz, Monterey, San Francisco and Alameda Counties. Juliene has worked in Alameda County since 2013 and is passionate about improving services and systems so individuals and families are able to access the right kind of behavioral health service at the right time to support them in their recovery. We welcome Juliene to ACBH! DESCRIPTION: The training emphasis is placed on exercising self-control and systematically utilizing least-restrictive measures versus attempts to externally control others. You’re invited to Diana Cruz’s Retirement Celebration! I am pleased to announce the appointment of Marguerite Wilhite to the position of Clinical Manager of Oakland Children’s Services. Marguerite has over 14 years of experience providing services to ACBH child clients in the Cities of Alameda and Oakland. Marguerite is a graduate of UC Berkeley with a Masters in Social Welfare and began her career in San Francisco with child survivors of abuse. For the past 18 years she has held a private practice specializing in trauma. Marguerite has been a much sought after practitioner in family therapy, trauma therapy and advanced play therapy techniques. I am pleased to announce the appointment of Michelle Lewis to the position of Clinical Manager of Oakland Adult Community Support Center. Michelle has over 12 years of experience providing services to our consumers. She started working for ACBH as a Behavioral Health Clinician at Oakland Community Support in 2007 and in 2017 became the Clinical Supervisor. Michelle continued to provide direct services to clients and community partners in her quest to improve the quality of life for individuals served within Alameda County. Please join me in welcoming Michelle in her new leadership role. I am pleased to announce the appointment of Rickie Lopez to the position of Interim Network Office Director effective January 15, 2019. Rickie will be managing and directing the procurement and administration of the Mental Health and Substance Use Disorder contracts including contract development/negotiations/renewals, budget planning and development, etc. Fiona and Rickie will be working closely with the transition in the next few weeks. In addition, I would like to extend a formal appreciation to Fiona for her leadership, hard work, and dedication over the years at the Network Office. Best wishes Fiona! This message is to update you about an IMPORTANT DATE CHANGE for the training: Dismantling Implicit Bias: and Healing Racial Trauma (instructor, Ken Hardy). Due to unforeseen circumstances, the trainer is unable to teach on January 17 as planned. The NEW DATE for this training is January 23, 2019, from 9:00am – 2:30pm. YOUR REGISTRATION: Since you are currently enrolled for January 17, your enrollment be moved over to the new date. If you are receiving this message there is no need to re-enroll. The ACBH Adult and Older Adult System of Care (AOASOC) is committed to designing a system of care whose foundation is built on the concepts of prevention, early intervention and “right-matched” services. Over the next three-to-five years as we engage in systems change, the AOASOC will focus on five major areas. Due to unforeseen remodeling delays, Sally’s Place Peer Respite will be open for services on 1/21/19, not 1/14/19. Please share this updated flyer with your contacts. TRAINER: Colleen A. Sanford, LCSW, Dynamic Mindfulness Certified Trainer, and Certified Clinical Trauma Professional. DESCRIPTION: Day 1: is Dynamic Mindfulness Foundation training is for ALL ACBH staff who want to learn mindfulness in movement, breathing, and meditation for stress management, self-care, and healing from personal and secondary trauma. (Note: the One-Day session alone, does not qualify for CE credit). Day 2: is for clinicians who want to use the methods in their practice with clients, or teach it to others. FOR THOSE WANTING CE credit, register for the two-day version. BOTH DAYS must be attended. DESCRIPTION: Motivational Interviewing is a client-centered, disciplined method for enhancing intrinsic motivation to change by exploring and resolving ambivalence. 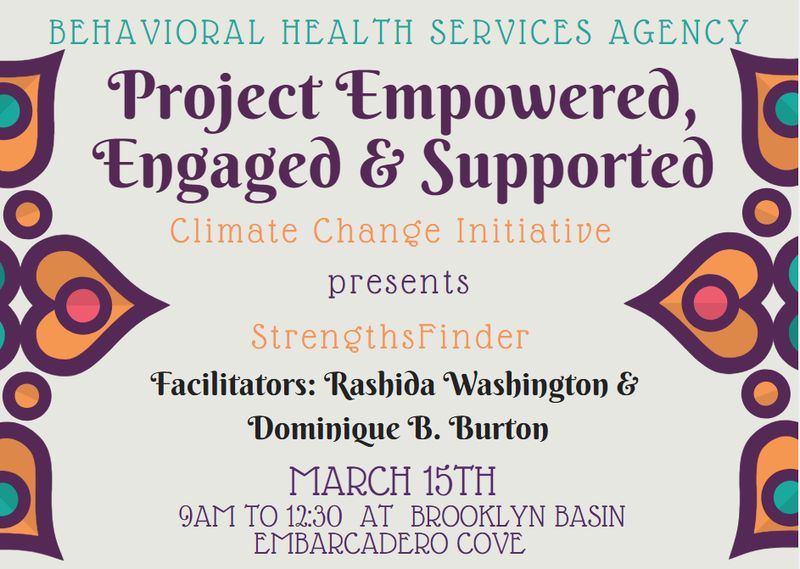 The goal of this training will be to build skills around engagement using the tenants and techniques of Motivational Interviewing. This training is highly interactive and requires participation. AUDIENCE: Social Work & Mental Health Providers Contracted with Alameda County Behavioral Health. Attendance at all three sessions is not required, however pre-registration is necessary. Audience: Alameda County Behavioral Health and contracted CBO providers of substance use treatment services. See fliers above for details and Registration (you must register for each of the sessions you would like to attend). To All Stakeholders: Starting January 2, 2019 Alameda County Behavioral Health ACCESS program will begin conducting all assessments and assignments for adult and older adult levels of care/services. Crisis Response Program (CRP) will cease taking referrals December 31, 2018 and will transition all bridge case management and medication service clients to correct levels of care. CRP is transitioning to provide field-based mobile crisis intervention teams throughout the county. A detailed email about system changes will be published shortly. With the introduction of the urgent care medication services and ACCESS assigning levels of care for all adults, persons served will be helped more quickly and should result in greater connection to the right-matched services. Due to this change in the system, providers need to contact ACCESS for all service referrals starting January 2, 2019. 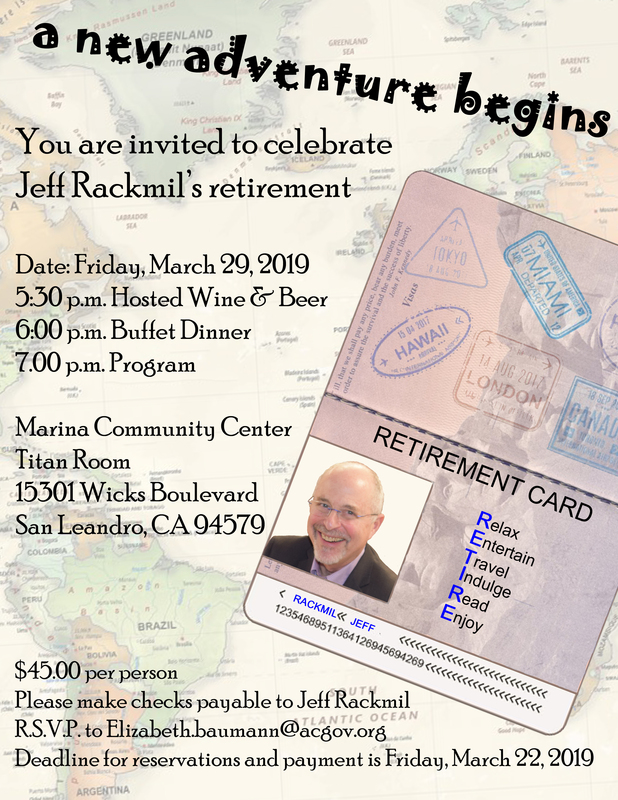 Save The Date - Jeff Rackmil's Retirement! Jeff Rackmil is biting the bullet, pulling the plug, retiring! The fine print: Please respond to Elizabeth.Baumann@acgov.org no later than Wednesday, January 2, 2019! Your “yes” or “no” response does not constitute any kind of commitment on your part. We are merely trying to get an estimate of the numbers we’re talking about. While we want to be sure there is room for everyone, we also don’t want 50 people in a room that will easily take 150! Thank you very much for your response! We wish you a joyful, healthy and happy holiday and a prosperous 2019. Dear Alameda County Behavioral Health Care Stakeholders: We are pleased to announce a new urgent care pilot that will focus on providing short-term medications for same-day needs. We are introducing this pilot program with the intention of expanding the pilot to other county-operated locations this Spring. I am pleased to announce the appointment of Sun Hyung Lee, LCSW, MPH, to the position of Interim Transition Age Youth (TAY) Division Director. In this role, Sun will be responsible for the oversight of all services provided to TAY under the Child & Young Adult System of Care (CYASOC). Sun has been with Alameda County for almost a decade, as a Behavioral Health Clinician at Eden and Valley Children’s Services, a Program Contract Manager at the Network Office, and in her current role as a Program Specialist with the CYASOC. She also brings additional years of experience working in schools and CBOs serving children and TAY and coordinating programs in the field of public health. Please join me in congratulating Sun on her new role! This workshop addresses the role that race and implicit bias play in health inequities. What is implicit racial bias and how does it contribute to racial disparities, and why is it important for providers and communities to make them explicit and move beyond them? While mental health professionals are frequently viewed as more open to working with a wide range of demographic groups, research indicates that healthcare professionals exhibit the same levels of implicit racial bias as the general population. Alameda Behavioral Health Care Services invites you to review and comment on the MHSA Plan Update (FY2018-2019). Please email to MHSA@acgov.org any comments for the MHSA Plan Update (FY2018-2019). All comments will be received from December 6, 2018 until January 7, 2019. A full-day workshop in which participants will explore themes of implicit racial bias and white privilege, particularly as it pertains to the delivery of behavioral health services and supports. This training is intended for administrators, counselors, program managers, program staff, and therapists. This interactive and experiential training is designed to assist behavioral healthcare providers with developing and providing culturally sophisticated treatment to their African American clients through using beneficiary engagement as a continuous quality improvement (CQI) process. We would like to announce that the Court Advocacy Project (CAP) and Behavioral Health Court (BHC) will transfer to the Adult/Older Adult System of Care from Adult Forensic Behavioral Health effective October 15, 2018. We are excited about this move as it will enhance coordination and collaboration with the Adult/Older Adult System Of Care. CAP and BHC will continue to work closely with AFBH and the courts to develop alternatives to jail and connect justice involved individuals to community treatment services. Please click on the link to view a memo to Alameda Case Management/Care Coordination Providers, regarding Alameda County Care Connect and Alameda Health System pilot to engage patients receiving high numbers of crisis services at John George Psychiatric Pavilion. 2. Fred Finch - 8-18yo. Both Programs are based on the Wraparound model of family engagement. To be eligible, Children/Youth must meet SED or Moderate-Severe Criteria, and meet the criteria on the referral form and have Full Scope Medi-Cal, or Indigent or Undocumented. All referrals for the FSP Wrap Programs will be reviewed and authorized by the Alameda County ACCESS Program (510) 346-1083FAX. Questions? Contact ACCESS at 1-(800) 491-9099. If you are interested in applying for these funds please be sure to refer to the Calendar of Events on page 15, which lists key dates, including the upcoming Bidders Conferences. Description: Asian Americans are one of the most rapidly expanding racial group in the nation over the last decade and constitute nearly 6 percent of the U.S. population (U.S. Census Bureau, 2012). Alex Jackson, TAY Division Director for the Alameda County BHCS Child and Young Adult System of Care will be resigning from his position as of Friday October 5, 2018. Alex has taken a position in San Francisco and we wish him the best of luck in his new endeavor. I want to personally thank Alex on behalf of BHCS for his years of service and dedication to wellness and recovery of our beneficiaries. Alameda County Behavioral Health Care Services invites you to attend the Asian & Pacific Islander Mental Health Empowerment Conference (APIMHEC) on November 29 and 30, 2018 at Hilton Oakland Airport. This event will convene providers, consumers, policymakers, and community members interested in improving and reducing disparities in mental health services for Asian and Pacific Islander communities across California. The conference is free and continuing education credits will be offered. Please see the attached flyer and our website https://www.apimhec.org/ for more information and registration. Training Description: This workshop will use a mix of didactic, audience response, small group, dyad and personal introspection exercises with the goal of pushing staff and managers of substance abuse treatment programs/systems to identify personal, programmatic, systemic and policy factors that are affecting the effectiveness of services. The workshop presents evidence-based strategies for addressing those challenges. Each learner will craft an action plan for initiating personal, programmatic, systemic and advocacy interventions in their professional setting as appropriate to their role. 6 CEs available for RNs, Addiction Professionals, LMFTs, LCSWs, LPCCs, LEPs, and Psychologists LOCATION: The California Endowment, 2000 Franklin St., Oakland, CA 94612 DESCRIPTION: Topics will include a review of new legislation affecting healthcare providers and their clients including new rules affecting licensure and training, access to records, gender issues, mandated reporters, drug prescribing, and involuntary treatment. Also, information will be provided on minor consent and the new 42 CFR Part 2 substance use disorder confidentiality regulations. TRAINER: Linda Garrett, JD, Garrett Consulting Group and Risk Management Services. (See flyer for detailed description). AUDIENCE: Alameda County Public Health Nurses and BHCS SUD Providers. To REGISTER: go to http://alameda.netkeepers.com; open until filled. Registration DEADLINE is two (2) days prior to the training date. The External Quality Review Organization (EQRO) is scheduled to visit BHCS from Tuesday, October 30 � Thursday, November 1, 2018. BHCS Staff and CBO providers will be requested to take part in the completion of required documents and participate in the site review sessions. Quality Management staff will be reaching out to respective individuals by email with further information. Please stay tuned. To All BHCS Stakeholders and Staff: Alameda County Behavioral Health Care Services would like to update you on the recent Full Service Partnership (FSP) awards and transition process. Please see the attached memo. Thank you! Don�t Miss This Opportunity for Peer Training and Employment The California Association of Mental Health Peer Run Organizations (CAMHPRO) is a non profit statewide consumer run advocacy organization. CAMHPRO�s mission is to transform communities and the system for all those affected by mental health issues by championing the work of consumer-run organizations. CAMHPRO strives to empower, support, and ensure the rights of consumers, eliminate stigma, and advance self-determination and choice. CAMHPRO invites applications for Alameda County Accelerated Peer Specialist Program (ACAPS) training. The application deadline is: FRIDAY, October 12, 2018. Applications will not be accepted after this date. If you have any questions on the application process, eligibility or requirements, please contact Ebony Jacob, ACBHCS Internship Coordinator at: ebony.jacob@acgov.org or (510) 567-8093. The Health Professions Education Foundation (HPEF) is now accepting applications from Aug.1 - Oct. 9, 2018, for the Licensed Mental Health Services Provider Education Program (LMH). If you are a health professional working in an underserved area of Alameda County, have outstanding educational debt, and meet other important application criteria, you may be eligible to apply for up to $15,000 of loan repayment! HPEF will also host technical assistance calls to ask questions and assist with applications. Please see the attached documents for complete information and TA call schedule. Alameda County Behavioral Health Care Services is bringing the second annual Asian and Pacific Islander (API) Mental Health Empowerment Conference to Oakland on November 29 and 30, 2018! This year�s theme is Unified In Resilience: Drawing Strength from our Communities. ACBHCS is bringing the 2nd annual Asian and Pacific Islander (API) Mental Health Empowerment Conference to Oakland on November 29 and 30, 2018! This year�s theme is Unified In Resilience: Drawing Strength from our Communities. We invite you to forward this call for workshops to API providers you may think interested. For Submission Guidelines, view here. The workshop proposal should relate to the theme, �Unified In Resilience,� showcasing research, practices, and stories that enable APIs to draw resilience from our diverse communities to address mental health concerns. Alameda County Behavioral Health Care Services has an immediate need for qualified individual mental health providers/practitioners to become part of our fee-for-service Provider Network to provide outpatient eating disorder treatment to Alameda County youth and adults who are eligible for mental health benefits under Alameda County�s Mental Health Plan (MHP). Please help us circulate the announcement. Providers Clinical Support System (PCSS), a grant project funded by the Substance Abuse and Mental Health Services Administration launched a new, streamlined website to make educational resources, trainings, and mentoring on substance use disorders and co-occurring mental disorders easier for health care professionals to access. The model was created to address the opioid epidemic and give clinicians evidence-based resources and trainings they can apply to their clinical practices. Made up of a broad coalition of national health care organizations, PCSS represents over one million health professionals nationwide. Browse free resources and start training today. Creating Home: Queer Identities, Families, and Spaces 2018 Films & Curriculum Now Available For Free! SUD contracted providers offer and provide treatment plan focused counseling sessions that are associated to client challenges and action steps designed to support recovery from SUD and relapse prevention. Clients whose recovery outcome may benefit by including tobacco use as a challenge (problem) in their treatment plan may receive tobacco related services from the DMC and/or SUD contracted provider. Group services may be provided when a client�s SUD symptoms and recovery potential are negatively impacted by Tobacco/Nicotine use. See Full Memo for Documentation Requirements. The National Institute of Mental Health (NIMH) is hosting a workshop on adolescent suicide prevention that will highlight techniques for early detection and intervention among young people at risk. The event will take place on January 24 from 8:30 a.m. to 12:30 p.m. ET. To watch the livestream or video archive, click here. The Quality Assurance Office recommends the following resource: LGBT Health Line News from the National LGBT Health Education Center. Alameda County Behavioral Health Care Services invites you to review and comment on the FY17-20 MHSA THREE YEAR PLAN. Please email any comments on the FY17-20 MHSA THREE YEAR PLAN to MHSA@acbhcs.org. All comments must be submitted by 2/16/18. I'm excited to share our latest newsletter, which highlights our ten BHCS Individual Placement and Support (IPS) employment programs. This issue includes client success stories from FACT, BOSS and Telecare STRIDES; team spotlights from BACS, Telecare CHANGES, Abode, and Fred Finch Youth Center; an employer feature; and other exciting tidbits. 42 CFR Part 2- Judicial Districts in California. Alameda County is in the Northern District of California. The provider must provide contact information in case of a complaint or breach of confidentiality to the beneficiary / client. The Office of Ethnic Services would like to share the following list of resources to aid all BHCS Staff and Providers looking for ways to support our LGBTQ community. Should you have any questions, please feel free to contact the BHCS Ethnic Services Manager at Javarre.wilson@acgov.org or at 510-777-2118. We will continue providing early childhood home-based and clinic-based mental health services, as well as mental health consultation in early care and education (child care) programs in Alameda County. We are pleased to announce that BHCS has re-launched the Alameda County Trauma Informed Care website. Information and resources about Trauma Informed Care are posted in the following sections: Trauma Informed Care, Trauma Informed Agencies, Caregivers & Providers, Trauma Survivors & Family, and Resources. Learn about how trauma impacts mental and physical health, trauma specific interventions, the fundamentals of a trauma informed agency, relevant webinars and trainings, vicarious trauma support, tips for self-care, and recommended learning resources. The Prevention Unit invites you to view its recently completed video featuring the work of BHCS� Substance Use Disorder Primary Prevention providers. The Voices from the Village Video and Companion Program Guide was supported with Primary Prevention funds and was executive produced by Kelly Robinson in collaboration with the Institute for the Advanced Study of Black Family Life and Culture, which served as the project lead. Voices from the Village highlights the ways in which community-based organizations build successful prevention programming around the indigenous protective factors that exist in culture and community. For more information please contact: Kelly Robinson, Program Specialist � Prevention. ACBHCS Vocational Program presents our latest biannual newsletter. The Training Registration Guide with instructions on how to create a user profile and password and how to register for a training activity is attached at http://www.acbhcs.org/Training/training_reg_guide.htm. For questions, please contact trainingunit@acbhcs.org with the subject header �Online Registration�. The Quality Assurance Office is reintroducing the Consumer and Family Assistance Phone Line.